I was raised here in College Station and have been working in various aspects of the residential building industry since the late 70's. Starting in High School I worked summers as a trim carpenter and painter. After High School I joined the Air Force Reserves and spent a few years there. When I finished my active duty training I came back here and attended TAMU majoring in architecture. I was not really very interested in the commercial side of construction and in those days I really wanted to be a designer/builder so I left TAMU and got a job as a building superintendent for a local home building company. I went on to have my own home building company and in total had the responsibility of construction of about 100 houses. In 2002 decided to refocus on my original interest of design. I enjoy helping people off to a good start and I believe all of my practical experience in addition to artistic training makes me a better designer. I generally do not resell plans as stock plans. I find that most people who want a plan drawn do so because out of the 100's of thousands of plans available on line they have not found just the right one. 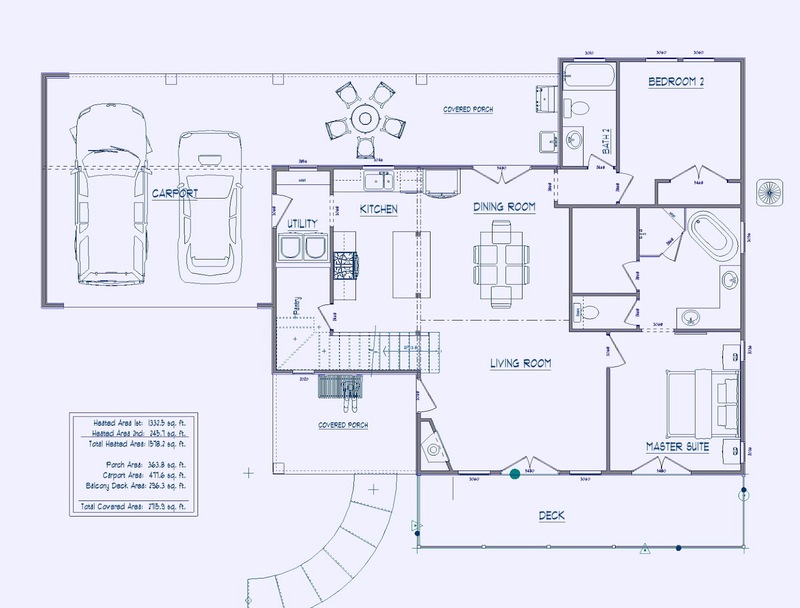 I can generally create a new custom plan at the same or less cost than most Home Plan sites. We start by reviewing your needs. Do you need a basic plan set or more? It is certainly possible to do this by phone + email or digital conferencing or we can meet in person -which ever you are most comfortable with. 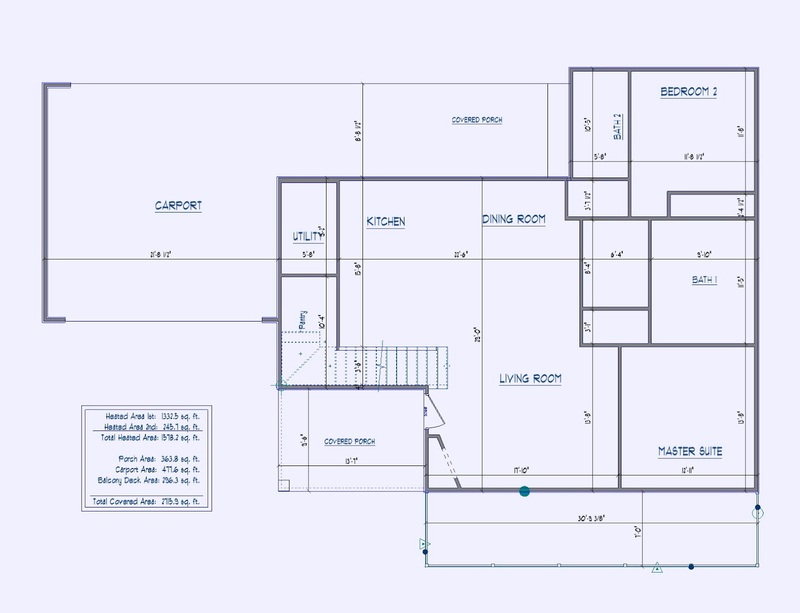 Once we get the basic parameters of the project established I will rough in the walls to get a room layout with approximate room sizes and relationship. ..or we can use a screen sharing app like Skype or meet in person. -whichever is most convenient for you. Then once the basic floor layout is established we will start putting in major details like doors, windows, appliances, plumbing, etc.. The less uncertainty I have the more I will draw a complete plan before sending it to you for review. I will also include alternate ideas if needed. For example -if I feel your design can be improved or you just want to see a few options. At this point you know the heated, covered porch, garage and covered area square feet and can start to get an idea if it will be in your desired range. It is not common but I have occasionally had to completely redo plans because the clients did not have a clear concept of what they wanted and or could afford. 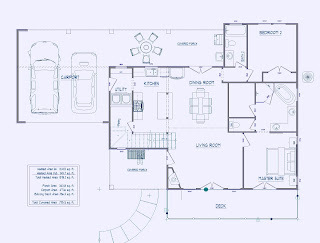 A typical project will have 6 + (area x 002) plan rough ins to go from the start to this stage where I send you the current plan and you comment on any changes or questions you have. I call these exchanges where I send you the plan and you give me feedback. Once we get a basic floor layout established I will pretty quickly rough in an exterior so that we can see what the basic shape of the house will look like from the outside. All the houses I create are 3d models that can be viewed from any angle. to view and talk about the model in real time. Just keep in mind that I make every effort to deliver efficient and low cost design and that means getting to the final plan as fast as possible and with the fewest number of exchanges. The clearer your concept is the faster the design process will be. At this point I encourage people to talk to their builder or perspective builders to get a good sense of expected cost based on the rough in and your expectations of finish quality. I think it is better to take time to think everything through than to rush to finish the plan unless you are very familiar with plans and building houses. If we do a rough in where we get to the stage of having a fairly detailed model and then have to start over or you decide to not proceed for any reason this represents about 40% of the total design time of a typical house. Once you are comfortable that the basic design is a go then it is just a matter of doing an electrical plan, elevations, roof plan, final dimensioning and details and other drawing which may be needed. The reason I wait as long as possible to put in all the small details as that the more complete a plan is the more time it takes to make changes. 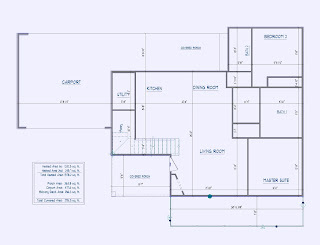 For example there may be some indecision about the master bath layout that affects its window placement. Early in the design it is easy to change but late in the design process this change will affect the finished elevation of that side of the house as well and electric plan and so forth that will make the change take 3 times longer or more to make. That being said it is not uncommon to have a change in the late stage but the goal is to avoid that. The plan is now ready for the builder(s) to do a detailed bid. A good thing about detailed specifications is that when you go to get bids for your house it is more likely that you are comparing apples to apples as they say. In other words, each builder is working off the same set of specifications instead of their own. The bad side is that it may take them considerably longer to bid that way and they may give a higher price because there are a lot of (for them) non-standard items. For example you find a bathtub online that looks really good but it is not the standard locally available tub. The online price is good but did not account for shipping, handling, unusual installation, etc.. I would suggest that you need to do enough research in advance to get a good feel for whether you are wanting specific non-standard items and then make sure that those are specified. Keep your own notes and work with builders to develop your own list of specifications. High end and specialty items tend to require advanced planning. Common items can be chosen as you go. Builders, architects and designers who specialize in high end construction will be more familiar with high end items than those who do not. I expect that some minor details will need to be worked out after the first bid set is made and before it is submitted for final building approval. This should not include moving walls or other changes to the structure.